A non-selective vegetation control herbicide, controls most annual and perennial grasses, including lawn grasses, broadleaf weeds and brush (i.e. virtually anything that is green and growing)Undesirable vegetation control (i.e. hard to- mow areas, around buildings). Apply to the following: Lawn trimming/edging, patio weed control, vacant lots, storage & recreational areas, driveways. Around Trees/Shrubs/Ornamentals Lawn/Garden renovation Brush control. Avoid spray contact on desirable plants as any plant contacted may be killed. Do not spray in windy conditions. Do not spray to the point of run-off. Rain or watering two hours after application will not wash away effectiveness. However, heavy rainfall immediately after application may wash the chemical off the foliage and repeat treatment may be required. Do not apply if rainfall is forecast for the time of application. For best results, to ensure that Roundup® gets down to the roots, avoid tillage or disturbing the treated area for 7-10 days (or as otherwise specified on the label). This will ensure that the entire plant, including the root, is eliminated. Rain or watering two hours after application will not wash away effectiveness. 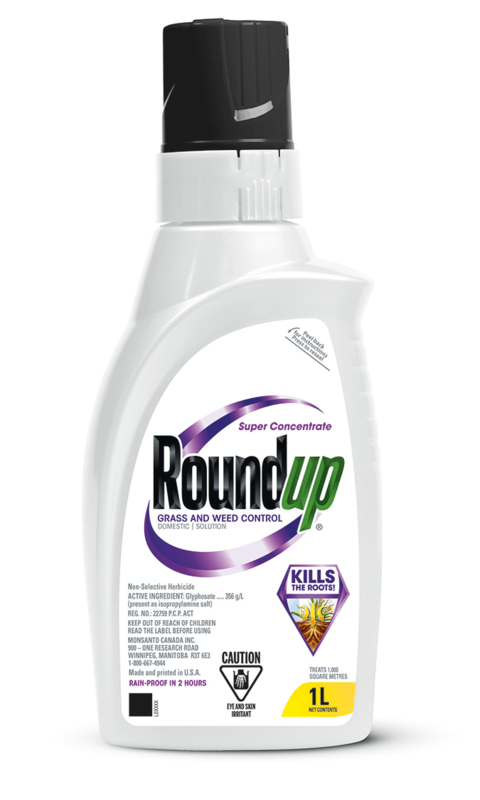 NOTE: Roundup® has no soil activity and will not leach or run off to affect nearby vegetation. Plants must be present to be controlled. Repeat applications will be required as new seedlings and vegetation emerge. Roundup® Super Concentrate eliminates all grasses and weeds over large areas and acreage. Makes 51L of end use product. Do not re-use empty container. Wrap and dispose of empty container in household garbage. Temperature should be below 32C. Avoid applying on windy days.